Good food, good wine and good company can get even better. 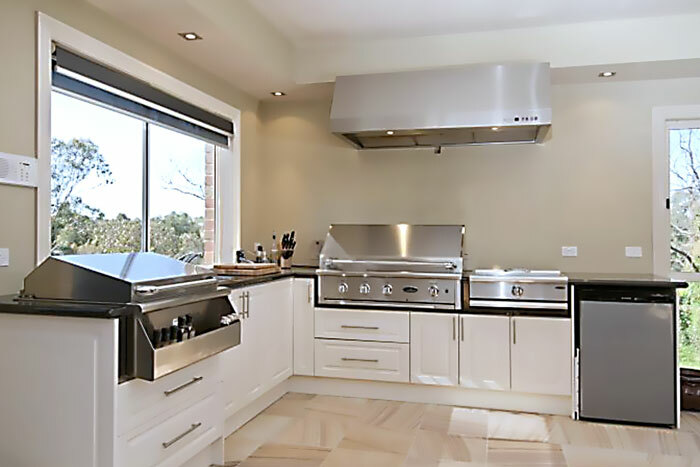 Grandview Kitchens can give you a functional and stylish outdoor kitchen to entertain your family and friends or just enjoy the great outdoors. In Australia, we enjoy one of the best climates in the world. 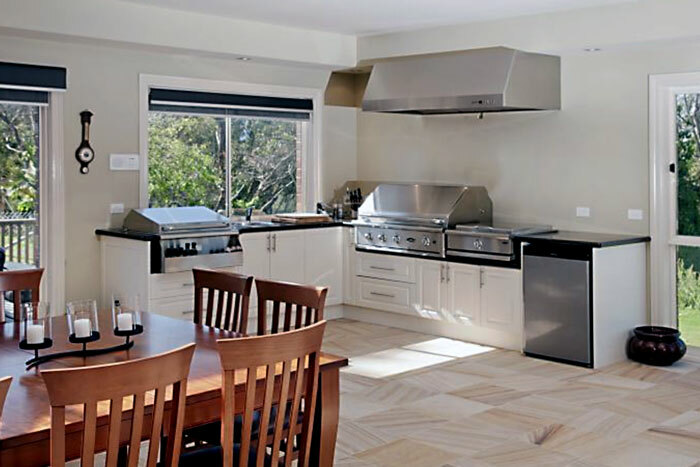 At Grandview Kitchens, we’re experienced in the unique design, material and construction needs of outdoor kitchens. Why be cooped-up indoors? Have a custom designed outdoor kitchen built and installed by Grandview Kitchens and enjoy alfresco dining all year round. Thanks to advances in outdoor kitchen design and materials, limiting outdoor dining to summer is no longer necessary. The grand tradition of the ‘Aussie barbecue’ lives on, but now it’s more sophisticated and comfortable than ever! You won’t have to abandon your guests to run inside and cook. Instead, Grandview Kitchens can bring your kitchen outside. Outdoor kitchens are a modern concept inspired by a recent lifestyle shift. Instead of back gardens and courtyards being barely-used ‘dead space’, outdoor kitchens and entertaining areas are bringing them to life. Today’s outdoor kitchens aren’t just any old barbecue area. Outdoor kitchens designed and built by Grandview Kitchens can be as simple or as luxurious as you like. Cooktops, multiple burners, rotisseries and wok burners – Show off your modern cooking style with different cooking appliances for any type of cuisine. Bar fridge – Keep pre-prepared meat or salads close by – and, of course, ensure your drinks are cool and convenient. Sink – Make keeping your outdoor kitchen clean a breeze with a handy sink. Storage space – Ensure the right cooking tool are easy to find when you need them. No need to rush inside at a crucial moment! Outdoor kitchens designed and built by Grandview Kitchens can withstand the elements and can even be suitable for year-round dining. Enjoy the outdoors with your family and friends – Your outdoor kitchen will make entertaining a breeze! Want to join your guests outside? Why stay cooped up indoors? Your family and friends will love spending time in your outdoor kitchen. Don’t even be surprised if they offer to help cook! 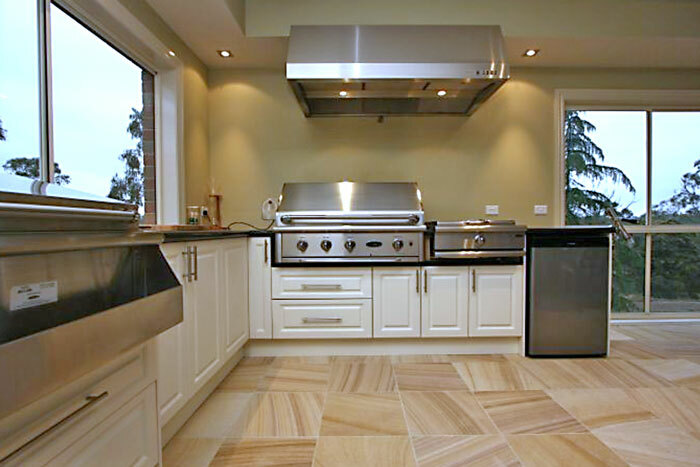 To find out more about exciting outdoor kitchen designs for your lifestyle, contact us.